Seeing that it was relatively a bold step (and breakthrough) in the medical field for treating a number of conditions, medical marijuana is a topic of great discussion when considering its efficacy, safety, and social impact at all levels. There are a number a reasons marijuana faced prohibition as early as the 1920’s; it was thought of as a poison, and little was known about its therapeutic properties. Little that could be considered relevant, scientific data to the medical field, anyway. As a result, it faced a great deal of harsh scrutiny over the years. Slowly but surely, however, that would start to change over the course of the century. As time went on, and marijuana was thought of less and less as criminal, medical institutions and the public became more receptive to the notion that cannabis could be used therapeutically for a variety of medical conditions. Since 2016, an overwhelming majority of patients treated with medical cannabis report with positive feedback when surveyed about the reduction of symptoms and cannabis as an alternative to traditional pharmaceutical prescriptions. 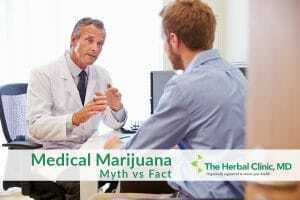 Here are some myths and facts about the timeless remedy making headway in the medical field today. This idea often keeps a number of drugs from ever seeing the light of day, sure. So much so that you often wonder whatever happened to those miracle breakthrough cures you heard of a while back (sometimes a decade ago) and then, nothing. Unofficially, cannabis has been consumed for medicinal, therapeutic and recreational purposes for thousands of years. In addition to that marijuana still stands out among some of the most studied biologically active substances in modern times. Its research even withstood stringent prohibition. Today there are a vast number of clinical trials and studies being done on the plant, while it also enjoys a medically legal status in over half the states in America. The idea that medical cannabis hasn’t been tested thoroughly enough is unjustified at best. Especially when considering the legal, dangerous and addictive nature of opioid treatments that are ever-contributing to the opioid crisis in America today. It was thought that legalization of marijuana, for any reason, would send the wrong signal to our nation’s youth. As we know, kids tend to be most impressionable beings that walk the planet. But there are two reasons this myth does not hold up. First, a study conducted by researchers at Rhode Island Hospital and Brown University concluded that there was no indication of rising adolescent marijuana use in geographically similar areas where medical cannabis had been legalized when compared to areas where it hadn’t. But certainly, geographically based samplings cannot account for the entire country. Nor will they have to. With the rise of hemp CBD (cannabidiol), the need for plants which contain the psychoactive THC (tetrahydrocannabinol), has become lessened. Though some therapeutic treatments may still call for THC plant-based care, it is usually up to the patient which product they prefer. THC? Or not THC? That is the question. Simply put, even if you have objections to the psychoactive effects of marijuana for you and for others, there are alternatives. This simply is not true. There are a number of organizations at the local, state and national levels which support cannabis for medical consumption. Some notable organizations are: the American College of Physicians, Institute of Medicine, Life Extension Foundation, and the American Nurses Association. There is also a good number of support groups who advocate for patients specifically such as the AIDS Action Council, the Epilepsy Foundation of America, and the Lymphoma Foundation of America, to name a few. The myth that medical marijuana use has no support from health groups (especially those who have a vested interest in the well-being of the patients they advocate for) is unfounded. For more information about how you can receive medical marijuana in Tampa, Hudson, or Beverly Hills, FL click here. Alternatively, call us at 727-202-4325 or click here to schedule a consultation.